Below is a compilation of all the research and studies I could find in regards to the collective benefit of group meditation, and its affect on the global unconscious. If you have any additional links or research to contribute, please feel free to reply to this thread and I will happily add it to this growing list. "For those with a basic layman’s understanding of quantum physics, it may come as no surprise that the simple act of meditation can have quantum results that affect not only the meditator, but his or her surrounding community and the world as a whole. EEG technology has been used for meditation research. A study on Brahma Kumaris Raja yoga meditators showed them having higher happiness (Oxford happiness questionnaire) than the control group. Positive relationships have been found between the volume of gray matter in the right precuneus area of the brain and both meditation and the subject's subjective happiness score. Meditation’s positive residual effects. Imaging finds different forms of meditation may affect brain structure. Full article is here, on Harvard's website. Click this to read. An experiment in Washington DC to study the effect of a large group of meditators on social trends, saw a rapid reversal in the violent crime trend during the project period. The researchers, led by John Hagelin a renowned quantum physicist, set up this major prospective social study. The idea was to show how easy and simple it is to reduce crime and social stress by using meditation to intervene from the field of consciousness. About forty earlier studies had already demonstrated the power of the Super Radiance effect to create more coherence in society. So the understanding of coherence creation with groups of meditators was already well established, at least with the research team if not the authorities. These precautions proved worthwhile. Ultimately, the research project was considered sufficiently sound, balanced and thorough enough to be published in the peer reviewed scientific journal 'Social Indicators Research'. Normally, the Super Radiance threshold for an area is the number of TM-Sidhas it takes to equal or exceed the square root of 1% (√1 %) of the local population, (About 173 TM-Sidhas for Washington DC). However, in this instance it was felt safer to create or exceed the Super Radiance effect for the whole country. So instead of aiming to attract 173 TM-Sidhas, the study team set out to attract in excess of 1,750 TM-Sidhas, the √1 % of the entire US population. As such, the researchers saw the city, as a focal point of collective stress both from the nation and the international community. They surmised that it was this exposure to global collective stress that provoked such a high level of crime within the area - over three times the national average crime level. But after this initial period and as the numbers of the meditating group grew, violent crime began a steep decline (to help standardise the statistical study, the researchers adopted the FBI's Uniform Crime Statistics definition of violent crime or HRA crime: homicides, rapes and aggravated assaults). From then on until the end of the two-month experiment, HRA crime stayed well below the time series prediction for that period of the year. The full paper can be read in the Collected Papers of the Scientific Research on Maharishi’s Transcendental Meditation and TM-Sidhi Program vol 6 - 489; published by Maharishi European Research University and Maharishi International University. Research Shows Group Meditation Can Reduce Crime Rates. Along with the mounting medical evidence of the various health benefits of meditation, research shows group meditation can actually reduce crime rates in the greater population. With connections which go beyond explanation by other variables, the results show that city-wide crime rates were reduced by small meditating groups of less than one percent of the population — not by holding community-wide meditation sessions or treating criminals with meditation therapy but by meditating on peace and positivity in small groups. Known as the Maharishi Effect, the idea is that individual brain waves can affect the collective consciousness. Though the exact science to explain how the brain waves of a small meditating group can effect the actions of the greater population is still not known, nearly 50 studies have been done on the subject and have appeared in prestigious publications such as the Journal of Crime and Justice. The form of meditation used to produce the Maharishi Effect is called the Transcendental Meditation Sidhi Programme. Those who have practiced this deep state of consciousness describe it as uplifting and say they “experience a state of bliss.” Several compare it to a feeling like they are flying, and in the Vedic literature it is even referred to as Yogic Flying. The Yoga Sutra states that “In the vicinity of coherence (yoga) hostile tendencies are eliminated,” and practitioners of this meditation program believe it creates a “unified field” which transforms stressful, negative, and undesirable tendencies in brain physiology. Whether science is able to prove their beliefs or not, the positivity and well-being spread by followers of the Maharishi’s meditation technique is certainly not a bad thing for society. 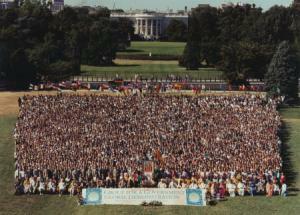 As many as 7,000 people have gathered at one time to meditate with the Maharishi in the name of world peace. Some of the most impressive research into group meditation came from Merseyside, England, which shows group meditation was not only able to reduce crime rates, but can save cities millions of dollars. A time series analysis was used to evaluate reduction in crime. During periods when a meditating group slightly larger than the square root of one percent of the population held sessions the monthly data showed a 13.4 percent drop in crime. This was very significant in contrast to the national crime rate which had actually increased by 45 percent. Even when considering variables such as police practices and economic changes the research still points to a strong correlation between the group meditation and the drop in crime rates. Merseyside went from No. 3 ranking in highest crime rates among the eleven largest Metropolitan Areas in England and Wales in 1987 to the lowest crime rate by 1992. The Merseyside Home Office estimated the reduction in crime saved around £1250 million over the five-year period. How does the Maharishi Effect reduce crime? Some researchers have proposed that the meditating group is able to increase coherence and decrease stress in the collective consciousness of a society, thus improving something referred to as “informal social control,” which reduces criminal acts. In a review of various research conducted on city, state, national, and international levels, 15 published studies showed strong evidence that group meditation was able to reduce crime rates, and programs like these can easily be replicated elsewhere.